Prepare for an action-packed day where you'll discover the wonders of West Iceland, go snowmobiling and uncover the secret landscapes to be found within an impressive ice tunnel. This is the perfect choice for those seeking adventure as well as natural beauty. Your destination for the day will be the spectacular Langjökull glacier which is Iceland’s second largest ice cap. Before you get there, however, you’ll make several stops along the way. After being picked up in Reykjavík, you will drive out of the city to your first location, Deildartunguhver, which is the most powerful hot spring in Europe; approximately 180 litres of 97° C water flows through it every second. 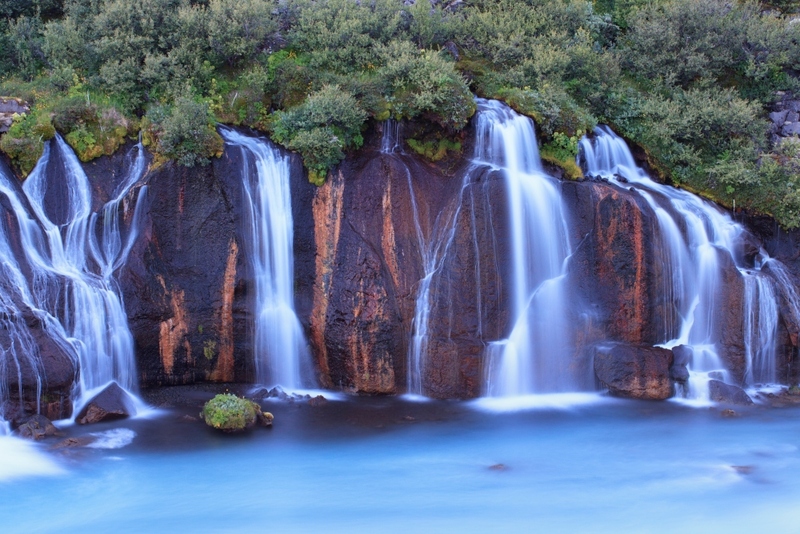 Your next stop are the neighbouring waterfalls Hraunfossar and Barnafoss which are very different in character. 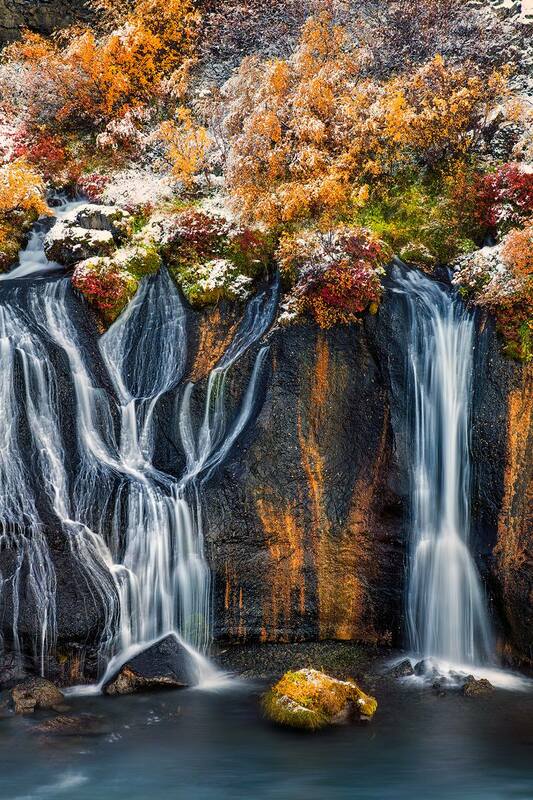 Hraunfossar is made up of a collection of gently flowing rivulets trickling from the bedrock whereas Barnafoss is a churning swirl of whitewash water flowing through a narrow ravine. You will break for the afternoon for lunch in the beautiful area of Húsafell before travelling onto the magnificent Langjökull glacier. You’ll begin your glacier adventure on the back of a snowmobile; following your local guide, you’ll whizz across the white landscape and take in the serene and spectacular views on offers. After a 15-minute journey, you will arrive at the entrance to the ice tunnel and your caving guide will lead you into the 200-metre cavern that reaches a maximum of 40-metres under the glacier. Marvel at the frozen blues and whites of your surroundings and relish this most unique of experiences. Once you’ve fully taken in the wonder of the ice cave, you’ll hop back aboard your snowmobile and travel back to basecamp. There, you’ll board your bus and make your way back to Reykjavík. Don’t miss this opportunity to visit some of the best sights in West Iceland as well as the unique chance to explore a 200-metre man-made ice cave. Check availability by choosing a date. Operation of this tour depends on conditions on the glacier. Due to sudden and unexpected weather changes the snowmobile ride might be cancelled after tour's departure from Reykjavík. This tour depends on weather, road and glacier conditions. Remember to dress warmly & wear sturdy footwear.